Music can make a scary game feel truly terrifying. Intensify the thrill of your games with Sinister Hollows. 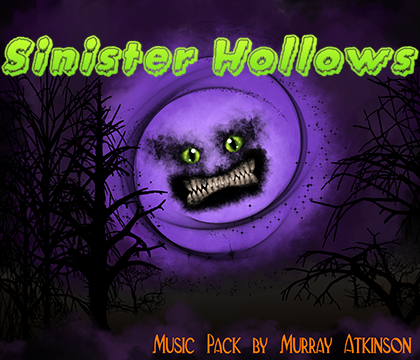 Created by Murray Atkinson, Sinister Hollows is a versatile music pack that can find a home in a horror game as well as a classic fantasy game that needs a touch of eerie and dangerous. Combining melodic sounds with ambiance, this unique pack still gives the right "video-game" vibe. 18 BGM tracks suitable for dungeons, character themes, cutscene themes and more. Includes dissonant music tracks to put your players on edge. Includes faster-paced themes suitable for battles and chase scenes.